They transport goods at a constant rate, usually using the shortest, straight-line paths. All things considered, substantial energy savings can be had with a well-designed conveyor system. Operate auxiliary equipment – devices that supply energy services to the major process technologies during their operation and are most common to industries. These processes include steam generation, permanent lighting, heating & air conditioning, and electric motors (conveyors are naturally in this category). Supply plug load – the electricity demand from all equipment that is plugged into electrical outlets in buildings such as office equipment, electronics, portable lighting, etc. There are various estimates stating just how much electricity used in industries goes through electric motors. Some estimates go as high as 70%. In any case, even though conveyors are energy efficient, there are still ways to improve the efficiency of any operation using them. Select the proper size of conveyor motor for the job. The motor should run at or near top capacity at all times. If load weights vary, use two-speed motors and adjustable-speed drives to enable motors to run near top capacity. Turn your conveyor off when it's not in use. Operate conveyors only when necessary. In some operations it may not make sense to continually switch them on and off, but you can efficiently do this in many cases. Use gravity feeds whenever possible. A well engineered conveyor system can often substitute gravity for power conveyor in the right situation. Maintain conveyors for maximum efficiency. Set up a preventive maintenance program for conveyor drives. Proper lubrication is a necessity in any energy efficient system using reducers, chains, bearings, etc. There are six major causes of drive failure to watch for: bearing failure, winding failures, rotor failures, improper speed-reducer lubrication, improper use of reducer, and poor alignment of the reducer with the motor or conveyor drive. Design the conveyor system with energy in mind. Use long, straight runs with fewer drives. If possible, power the entire system with one drive. Use high-efficiency speed reducers. Upgrade your technology. 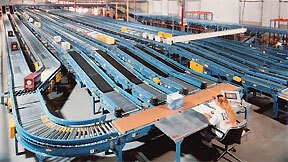 For accumulation conveyor, utilize advanced systems such as Gen 3 EZ-Logic accumulation systems. With its “sleep” mode the drive pull and amp draws are significantly decreased. This provides significant energy savings as well as reducing wear and tear on components. Consider replacing worn-out conveyors. If you use significant amounts of energy and need to reduce your costs, replacing old conveyor with newer, more efficient models may be the answer. Modern conveyors that are designed more efficiently and with appropriate controls can deliver significant return-on-investment based on energy savings.